In the last weeks since I've last posted I've run two races - a half marathon and 10K! I have race recaps scheduled on the blog this week. Can't wait to share. I'm thinking of signing up for more races - I will keep you posted. I do, however need to work on getting a little faster. 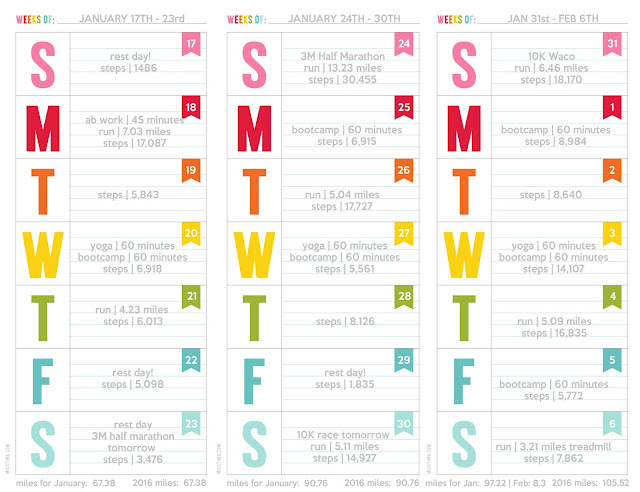 My bootcamp instructor and running partner are sharing a few tips and we are working to help me reach to my goals. By the way, they are both amazing marathoners. Since I've started to recored my steps, I can completely tell when I work from home. My steps for the day are a lot lower. I sit the entire time when working from home. When I'm in the office, I'm running around most of the day, I also park at the back of the parking lot...it's about 200 steps to my desk from the car each way. On days when I run, my steps are amazing. Do any of you have other clever ways to get in more steps each day?